Vaal Hazak is going to give even veteran Monster Hunter World players a headache. Here's how you can track and slay the monster. The Vaal Hazak is an Elder Dragon of Monster Hunter World, and definitely one of the more difficult creatures to face in the entire game. In our Monster Hunter World Vaal Hazak guide, we'll be firstly walking you through how and where you can find the beast, before providing you with all the information you need to take it on in combat. 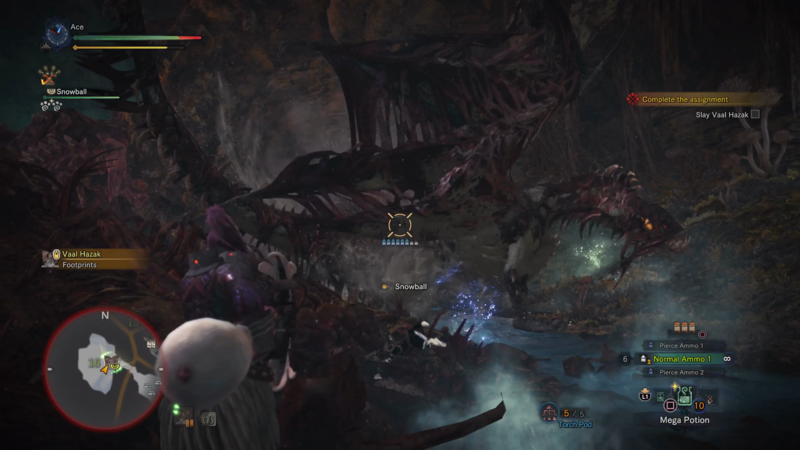 If you need anything else on the massive game of Monster Hunter World, including how to quickly track down any monster using the Scout Flies, as well as how to successfully trap a monster without fail, head over to our Monster Hunter World guides walkthrough hub. 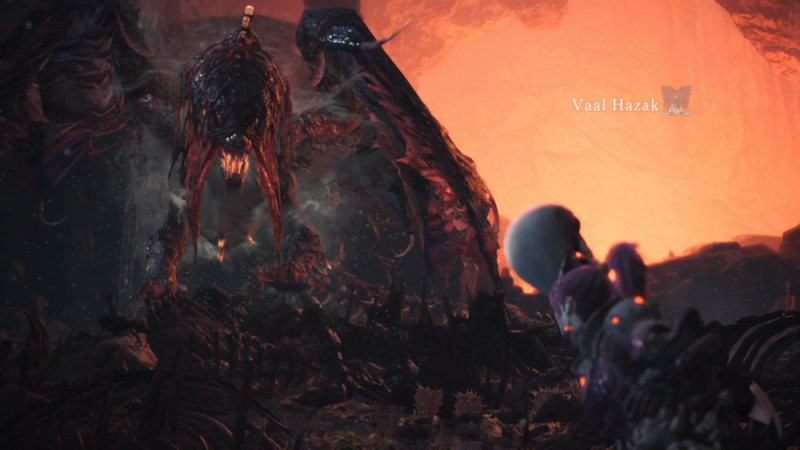 Hellish Fiend Vaal Hazak is the Elder Dragon you’ll finally have the opportunity to take down after you’ve successfully filled the tracking meter of the mysterious beast in the Rotten Vale. Unlike the fights with the Nergigante, Kushala Daora, and Teostra the Infernal, you won’t be fighting Vaal Hazak in the endgame Elder’s Recess area, as you’ll be taking on this boss in the Rotten Vale. To completely fill up the tracking gauge for Vaal Hazak, you're going to want to head into the depths of the Rotten Vale area, as we mentioned just above. We'd recommend starting from the Campsite at the highest possible level, and steadily working your way down each of the winding paths that the Rotten Vale map likes to push you down. Footprints are going to be your main method of filling up the tracking gauge for Elder Dragon Vaal Hazak, but don't worry if you end up having to make multiple trips back to the Rotten Vale to successfully fill up the tracking meter. All the traces of Vaal Hazak that you can find in this region actually reset every time you go back to Astera, so all you need to do is simply exit out and re-enter the region if you're having trouble finding any traces of the Elder Dragon. You’ll be familiar with the Rotten Vale’s ability to strip you of health pretty quickly whenever you get caught in certain areas of the map, and unfortunately for you, Hellish Fiend Vaal Hazak has the same ability. It continuously pumps out gas that’ll take down your health fairly quickly, and as such, we’d strongly recommend all players taking the Health Booster with them, when you set out from the Central Camp in the Rotten Vale. The Health Booster isn’t the only item you’ll want to utilise in the fight against Vaal Hazak, as we’d also recommend firing off an SOS Flare as soon as you come face to face with the Elder Dragon, if you’re not already with a team. If you’ve planned ahead and gone in with a group of friends, the best combination of weapons is two ranged, and two close quarters. Keep the close quarters weapons quick though (Dual Blades, Insect Glaive, and Long Swords work well here), as you’ll need to be constantly moving if you choose to go up close and personal with Vaal Hazak. The Elder Dragon doesn’t actually have a great many attacks at its disposal, but the few it does have you’ll need to be extremely wary of. 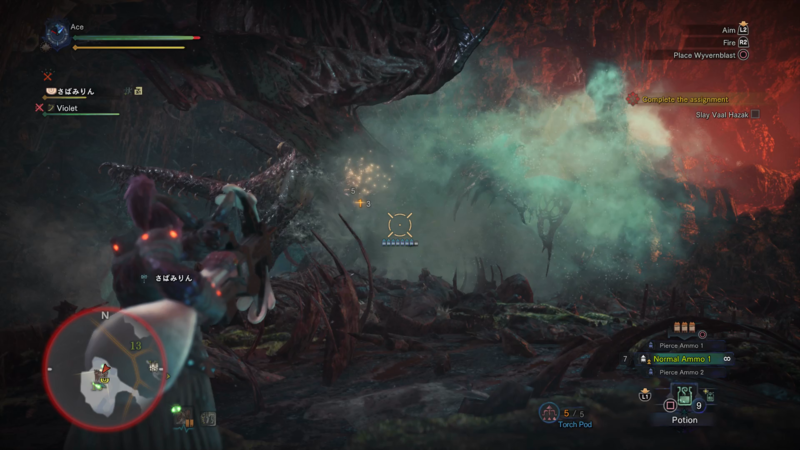 The most dangerous is where Vaal Hazak rears back its head, shooting out a jet of the poison-type gas from one side of the battlefield to the other. To avoid this, simply stow your weapon and run round to the side of Vaal Hazak, laying into the head of the Elder Dragon, as it’s prone to being stunned during this phase. Other attacks include Vaal Hazak letting out a burst of the gas from its body whenever it rears up on its hind legs, so make sure to move away from the boss whenever you see it stand up fully. Otherwise, the Hellish Fiend has simple attack of lunging straight forward with its head, snapping at you, or swiping its tail around if you’re stood behind it. The essential lesson here is to never linger in one place for too long, and you ideally want to have at least one Health Booster placed down at all times, that your team can fall back on if they become injured. If you’re going to take in a weapon with a certain element, then go for either fire or electricity, as Vaal Hazak can be stunned by both elements if hit with a charged up attack from a Charge Blade, Switch Axe, Hammer, or other heavy weapon. 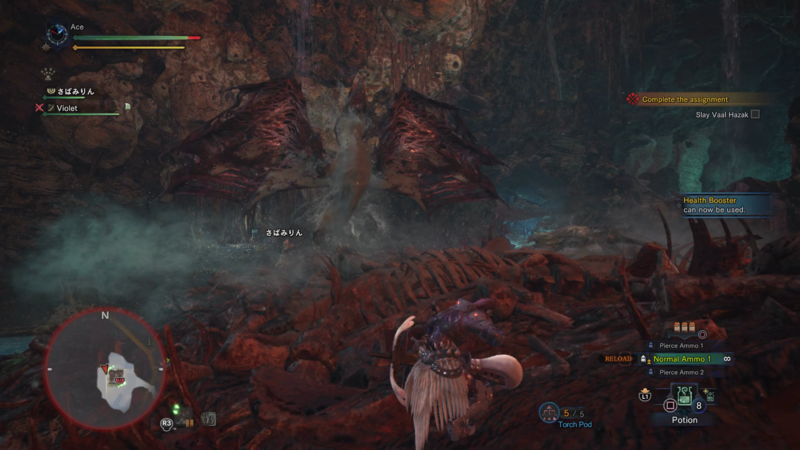 Aside from the head as the obvious weak point, you’ll also want to go for the tail, the hind legs, and the area just behind the head of Vaal Hazak, where its body connects to the wings, if you’re using a ranged weapon. We’re all done with our guide on how to take down Vaal Hazak, but continue ahead to our additional Monster Hunter World guides, including our full weaponry guide, as well as our guide to the best armor in the game.